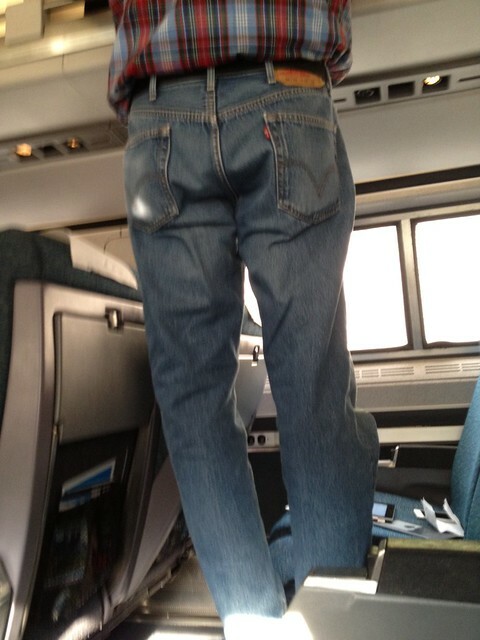 "Sir, your jeans are too baggy in the seat!" So sweet! 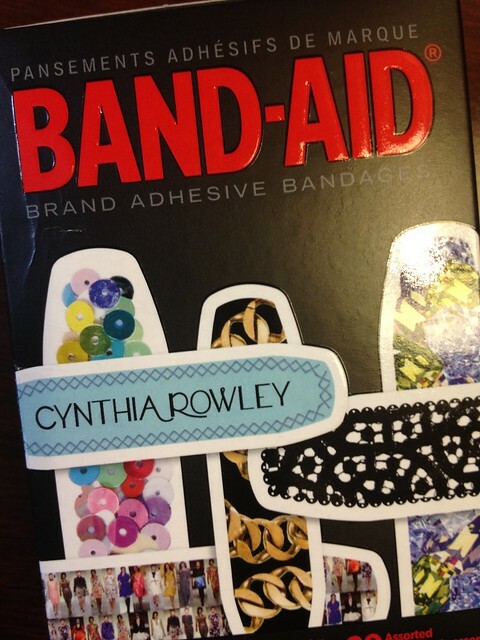 And some really sweet gifts, including a box of Cynthia Rowley Band-Aids! Nicole doesn't blog, but we had a nice time chatting about her exotic lifestyle with the foreign service. Mike was on North American holiday from Australia, and is just lovely to chat with. He has been working on a blazer that has turned out beautifully! Kyle suggested we get a drink and rest for a bit. It was on our way out of Mood that things got funky. I could tell something was up because the "flow" of the street had come to a stop. 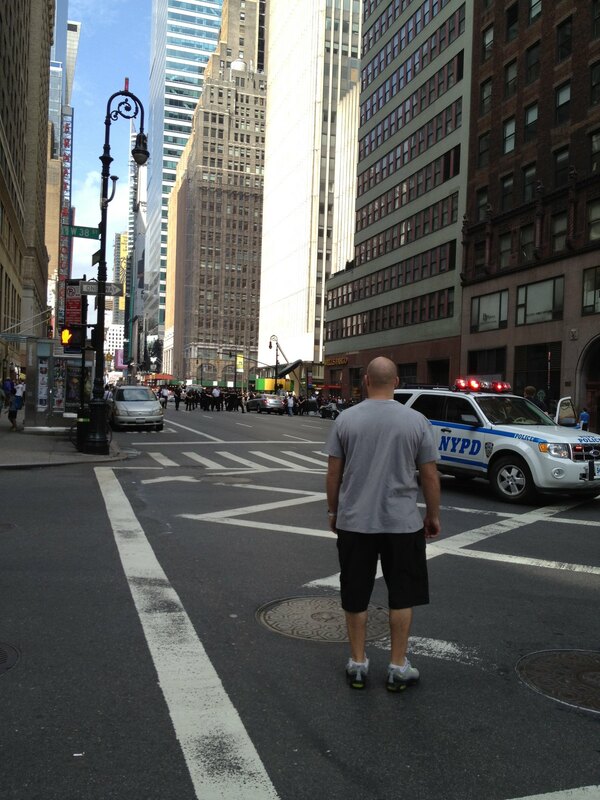 As we approached 7th Avenue, I could see lots of police cars and police officers. I took this photo without really knowing what I was photographing. I thought I'd add it to my "crazy things that happen when I visit NYC" catalog. If you want to click through to the original photo, hosted on Flickr, you'll see that there are a bunch of officers aiming guns. I originally thought they had stopped the little blue car. Turns out they were trying to stop the man behind the car. When I realized this, I noticed the man had something in his hand, and told Kyle I thought he had a gun. She suggested we walk west on 38th again to get some distance. We saw the whole procession of officers and suspect move just past us down 7th Ave. Kyle pulled out her map to see if we could get around this craziness to grab a cold beverage, and BANGBANGBANGBANGBANGBANGBANGBANGBANGBANG. Kyle grabbed my arm, and we ran into Pacific Trim, and I sobbed for a few minutes, quite sure at least one person had just died half a block away from us, and Kyle very kindly comforted me. Later I found out much more about what happened. If you Google "Darrius Kennedy" you can find out more, but unfortunately it seems most public discourse around this ended a few days after the incident. ANYWAY, to say the least, this was a difficult experience for me to shake off. 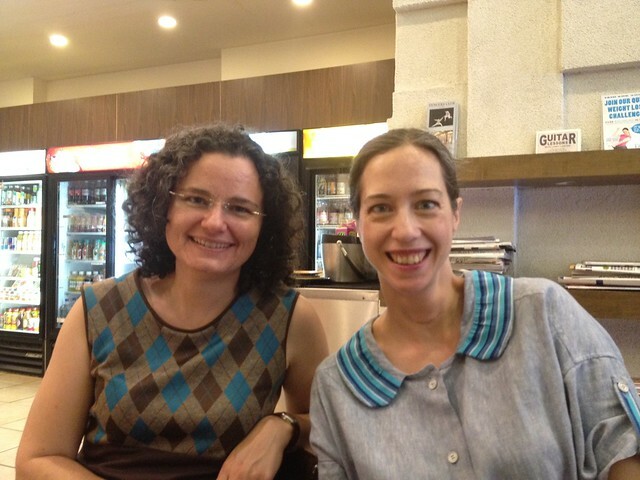 We made it back to Kinokuniya to meet the MPB group, share purchases, and say goodbye. Thank goodness they were all safe. I don't think I took another photo that afternoon. 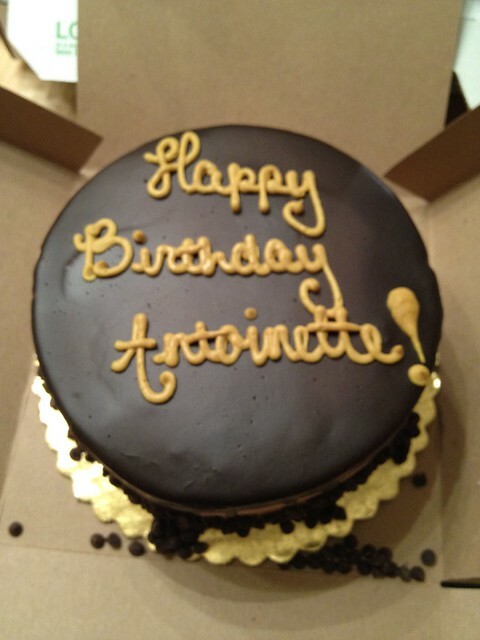 Peter's MPB Day wrap-up is here. After rest and relaxation, on Sunday, Kyle and I had a whirlwind day taking a wonderful food tour in Greenwich Village, and then shopping at every NYC spot we'd ever wanted to shop. Can I tell you first about the food tour? Sometime in February or March, I think, I got an email from a gal who'd seen the Norma Envelope Clutch on Pinterest. 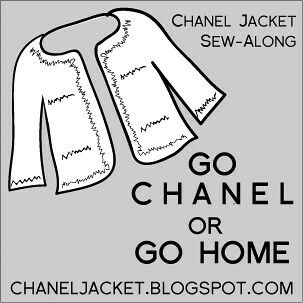 She emailed me to ask if I had any for sale, as she never intended to sew but would gladly purchase one. I don't do production sewing on any scale (boredom supreme! ), and have no idea how I'd price something like this, so I offered to send it to her and chalk it up to karma. She told me that she worked for a food tour company in NYC, and if I were ever there, to contact her so she could hook me up with tickets. So I did, and she did! Photo credit: Kyle! Thank you! I never would have chosen a food tour without this opportunity. I'm so glad we did this, and I will probably take more food tours in the future! 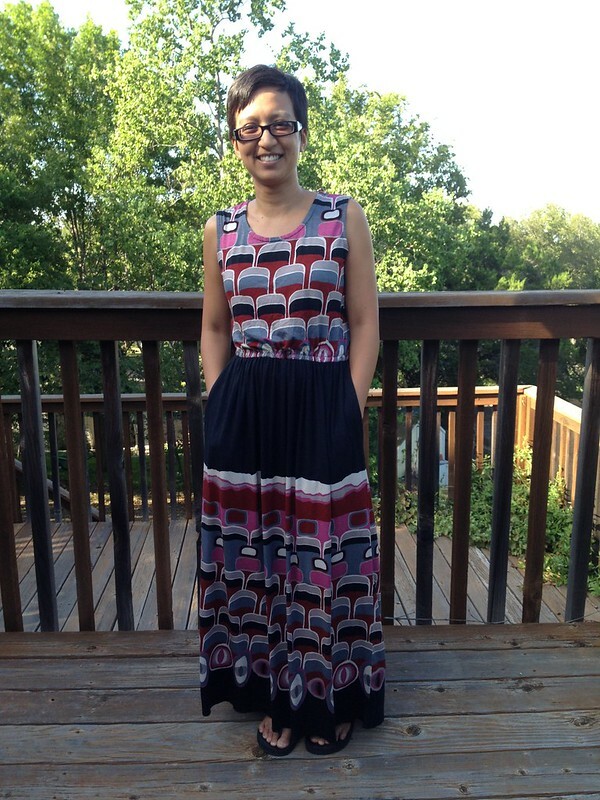 BTW that dress is a modified View B tunic from Butterick 5644. It's made with quilting cotton, and though I hated the stiffness at first, it has softened a lot and is a favored summer dress for me at the moment! About the food tour -- they were accommodating about our vegetarian preferences, all the food they served was delicious, and they stuffed us full! No joke. We learned so much about food, labelling laws, history, and architecture. 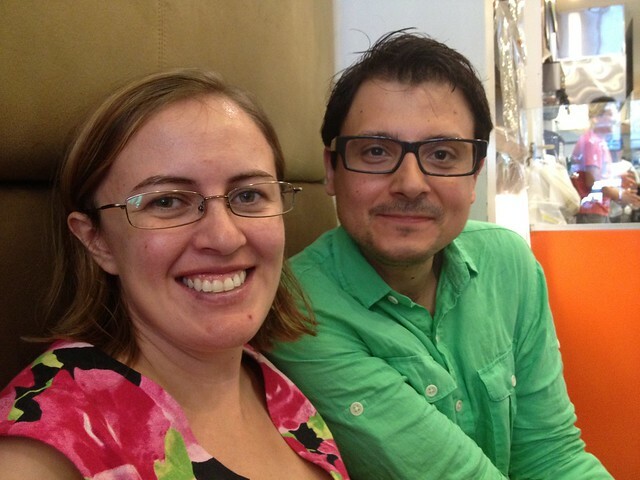 We met interesting people, some from near and some from far away (Australia!). I'm a food tour convert. That's the main image I'm trying to cement in my brain around this trip. :) Because if it weren't for one tragic incident, it would have been, overall, just a super-duper weekend. And mostly, it was. After the food tour, I recommitted personal funds to improving the economy by running around to Purl Soho, Warby Parker, No. 6 Store, Uniqlo, and Christian Siriano's new store. And at the end of the day, Kyle headed back home and I headed to NJ for work. 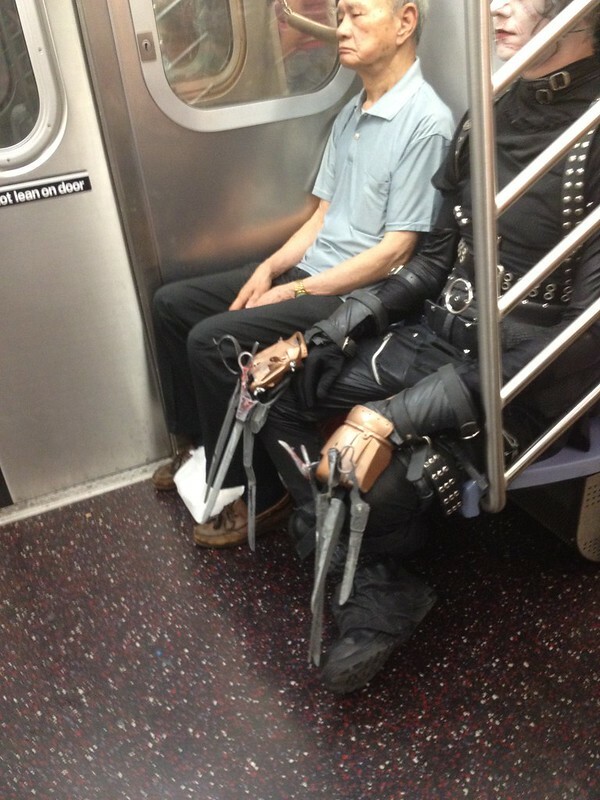 One last image from the trip -- we saw Edward Scissorhands on the subway! 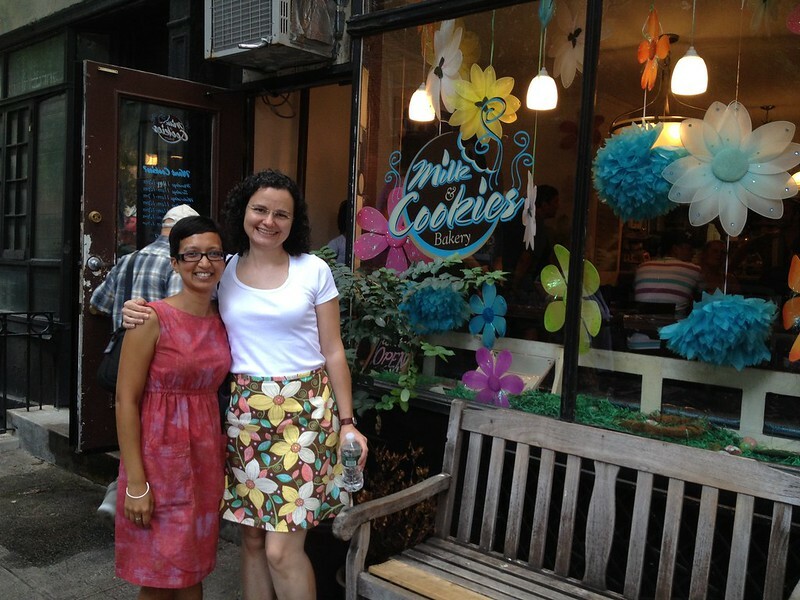 Kyle's post about our NYC weekend is here, and she's got lots more cool pics. Thanks for everything, Kyle! You are a wonderful friend and I'm glad I got to hang out with you at least once this year! happy birthday!sounds like quite an eventful weekend. Hey, I live in Princeton! 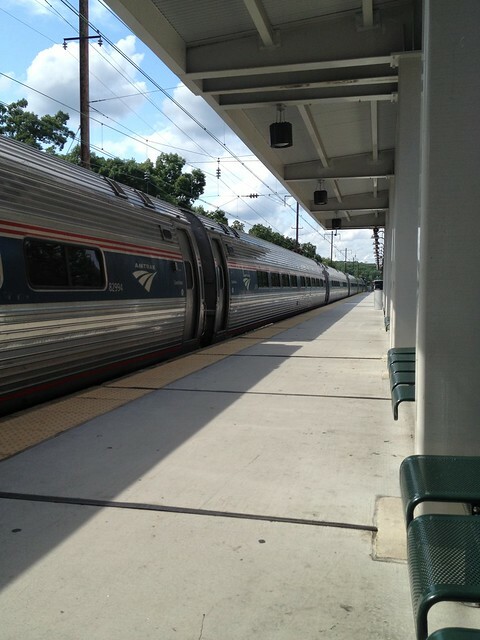 Amtrak is my favorite way to travel, but I'm sorry you had to use it. Yikes, your NYC incident sounded awful, but I'm glad you also got to enjoy all the wonderful shopping that is there. Sounds like you had a great time... minus the gunfire, of course! I'm leading a garment district tour in the near future, and researching the experiences of those who have been on recent ones, to see what they loved about their trips, so I know what is most appealing to the non-NYC'er. This was helpful! I'll be sure to read about Kyle's experience, too! 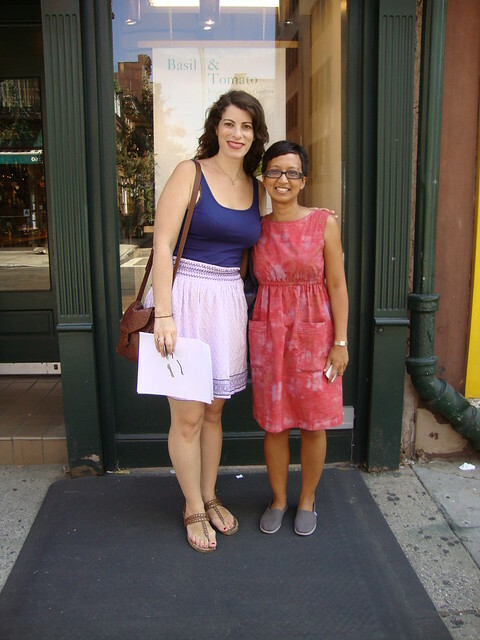 Hi Mimi, Kyle and I went to the Garment District last summer and used your Shop the Garment District site to help us get around. This summer we were not only more familiar with the area, but had very specific things we were looking for, so it narrowed the scope of our trip measurably. Quick note -- we loved Kashi and his shop, but he's closed weekends! Would have loved to stop by to see him and shop his wares. He is a character! And I was lucky that you visited! Miss you!! I've been to them both as well and I agree the Seattle one is better. 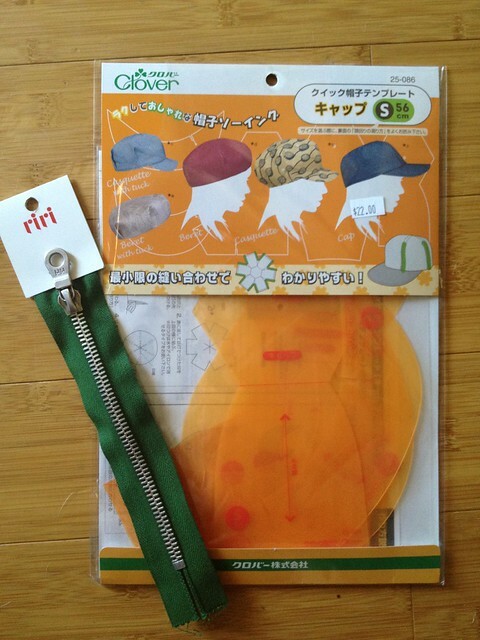 But the NYC one is cool too -- I never have trouble finding lots to love about any Kinokuniya! I'd love to see those books! This post was definitely photo heavy but that's okay! I enjoyed reading about your charades in the big city! I'm planning to go next month and your post is getting me super excited. I'm especially jealous about your trip to Mood! 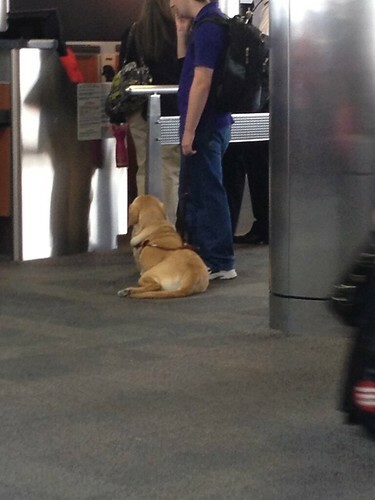 wow, that IS an adventure, and may I say what a stylish traveler you are! happy birthday! The dresses are beautiful! It sounds like a great trip despite the tragic incident. I would love to get back to NY one day. Wow, fabulous maxi dress! 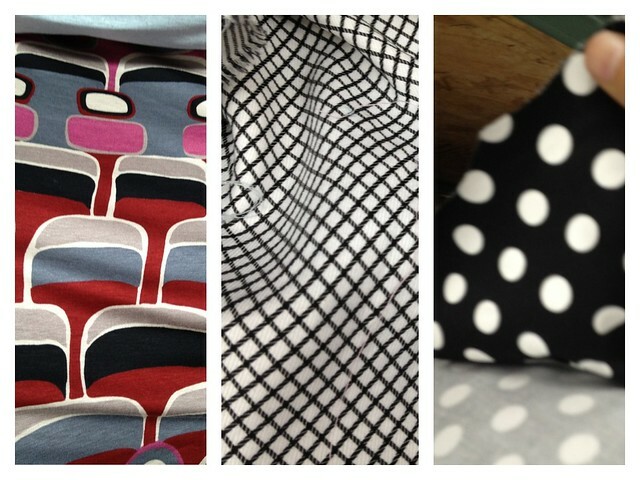 I really love the prints-luscious indeed :) and I think the black-prints proportion is just nice. It looks great on you. What a pretty birthday dress!